Large-capacity feeder for your flock. Made of strong, heavy-duty plastic. Easy to fill, thanks to the top-fill design and lid. Fill from the top and screw the lid on tightly to protect feed from the elements. Three legs are easily assembled to the base and keep the feeder off the ground. 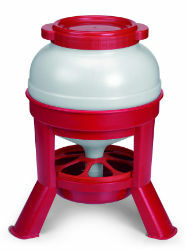 Feed Saver Ring minimizes spillage to prevents wasted food and is easily removed for cleaning. For chickens, ducks or other poultry. Available in 35 lb., 45 lb., and 60 lb. Options: 35 lb. 45 lb. 60 lb.